TCT Community Channel 2 is now the Flint Hills Life Channel! At the Flint Hills Life Channel (FHLC) we believe that learning about the culture, heritage and beauty of the Flint Hills Region, and what is happening in regional communities, will enrich and improve the quality of life for residence and visitors. Therefore, it is the mission of the FHLC to provide a dedicated, reliable platform and the technical resources needed to bring viewers information about stories and events sponsored by local organizations and businesses in the Flint Hills Region; as well as other thought provoking programming. 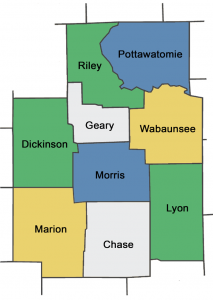 FHLC features news, events and human interest stories involving 9 counties in the Flint Hills; Chase, Dickinson, Geary, Lyon, Marion, Morris, Pottawatomie, Riley and Wabaunsee. The Channel is available to TCT’s cable subscribers, and available online. Click here to go to FHLC website. Please email us at fhlc@tctelco.net or you may call us at 620.767.8288 M-F 8a-5p. We will get back to you as soon as we can!